RampShot is an active backyard game that inspires friendly competition. It is a 4-person game, featured in our list of outdoor games for 4 people, that is more physically active then other popular backyard lawn games. It gets lots of attention when you are playing outdoors and is a fun spectator sport. There will be some jumping and diving especially with our RampShot Outdoor Drinking Game Rules! Each team member stands on opposite sides of the Rampshot. The goal is to throw the ball into the goal, net between the ramps that is an approximate 6″ gap. You win the round if you get the ball into the net, if your ball bounces off the ramp, your team mate must catch it. The opposite team can steal the ball if it bounces back or if your team misses the ball. The RampShot design has grooves around the goals that creates unpredictable bounces and many hilarious moments. In more detail, the objective of RampShot is to essentially throw a ball into a smaller target (Goal). Your team mate (Playmaker) stands on the opposite sides and work together by either throwing / catching / or returning the balls. If your Shooter throws the ball too short it normally bounces back to your competitors (Stealer). If you throw the ball too far past the goal your team (Playmaker) still may catch it or bounce back for additional points. Add a few beers into this his outdoor game and you will see why RampShot will be one of your favorite backyard drinking games! Flip the Ramp upside down and cover the Goal (middle of Ramp) with the netting. Make small loops with the bungee cord and place them around each end with the side hooks of (ABCD). Push the bungee cord down with your finger around the hooks on the Ramp. Make sure the netting is evenly apart and use the installation tool. If the netting is not distributed evenly, turn your Ramp on the side and use the hook to push the bungee cord down and over the rest of the hooks. The net needs to be evenly distributed and not too tight or ball will bounce out. Get your game face on ? RampShot is a 4-person game and is played 2-on-2. The Shooter & Playmaker are on teams and sit at opposite sides. Stealer and Odd-person out are on a team and sit at opposite sides. The names and positions are listed below. To decide who goes first a game of rock scissors papers or other change of luck is recommended. The area of RampShot field is setup similar to how horseshoes are played. Partners stand on opposite area and the Shooter throws the ball towards the Playmaker’s Ramp trying to land it in the Goal. At the same time, you have your opponents who will try to distract you and steal points from you. As you can see from the image of Ramp that it is sloping design so it is easy to undershoot potentially bouncing back to the Stealer. Throwing the ball too far may make it an eligible play for your team mate (Playmaker) who will either catch (1 point) or possible bounce it back to you (2 points). Shooter. The shooter throws the ball at the goal on the other ramp where your partner (Playmaker) waits behind the line. The Shooter tries to throw the ball landing in the goal of the Ramp without bouncing backwards or the playmaker can not go for it. Playmaker. The playmaker waits on the other side behind the line if the ball you through bounces behind the line. They can either catch the ball (1 point) or slapback (2 points) knocking the ball back to the shooter avoiding being intercepted by the stealer. Stealer. The stealer sits behind the RampShot line on the same side of the shooter. If the Shooter misses the target and it bounces back the Stealer will try and catch it. If they catch it or intercept a Slapback from the Playmaker, they will receive an extra turn next throwing round. Odd-Person-Out. One time per round you get a quick rest and may use this to refill your drink or be a peanut gallery. The first team that hits 15 points wins! You must get this exact number and not go over. If you get over you will not get any points and your turn will end. Only the Shooter and Playmaker can earn points in a round. Anything with the Stealer results in an extra throw next round. Single Point. The Ball is thrown by Shooter and bounces over the Ramp where the Playmaker catches it. Double Point. This happens when the Playmaker redirects the ball back to the Shooter by slapping it without ever touching the ground. If the Shooter has not crossed the throwing line by his Ramp and catches it will count as two points. The Stealer can intercept the ball in front of the Shooter then will count as a steal for them. This is called a Slapback and is new RampShot rule. Triple Point. The Shooter tosses the ball and it lands directly into the Ramps Goal. If a ball clearly lands in the Goal and bounces out is still counts as 3 points. If the ball that rattles the Goal but does not stay in will be treated as any other Ramp bounce type for the Playmaker to try and catch. 1. The Shooter gets two throws per round. 2. Stealer must keep one foot behind line until it has left the Shooters Hand. 3. Points are 1,2, or 3 with full descriptions above. 4. Shooter can not throw ball until the Stealer is back behind the Ramp line. 5. Stealer may not pass the other line of the opposing (Playmakers) Ramp to make a catch. 6. The game will only be completed after the round and both teams have a had their turn to throw. 7. The first team to reach 15 wins. 8. If an overtime is required (teams being tied at 15) the game will be extended to 21. So what are you waiting for? 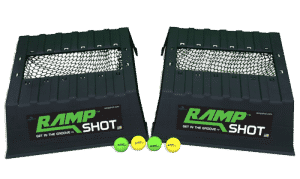 Order your Rampshot game online and break it out at the next sunny day in the Backyard for a group of friends. Would love to know your thoughts on this game if you have played below. Game description: Active 4 Player interactive game called Rampshot. The design of the RampShot Ramp makes the ball bounce all over the place and skill to land it in the goal making it a fun challenge to play with a group.